Pembroke House, Privy Gardens, Whitehall, London. London town house of the Earls of Pembroke. The Buildings of England. London 6: Westminster. Simon Bradley and Nikolaus Pevsner. 2005 edn. "Pembroke House", in Survey of London: volume 13 (1930), pp. 167-179. 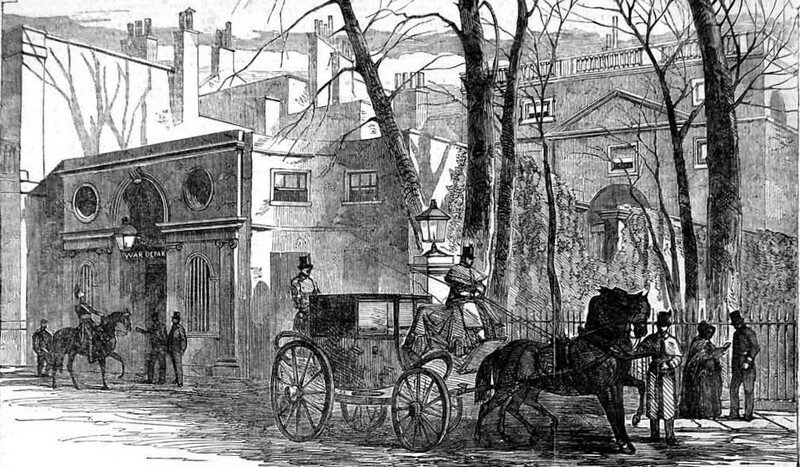 "Pembroke House, Whitehall", Steven Brindle, The Georgian Group Journal, vol. VIII, 1998, pp.88-113. Pembroke House was built by the 9th Earl of Pembroke (not then the Earl) in 1723-24, on the E (River Thames) side of Whitehall. The 9th Earl had obtained a lease in 1717. 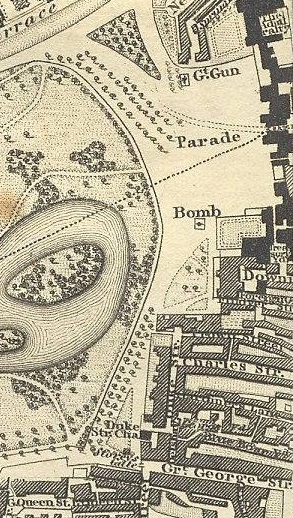 The site was formerly part of the great Palace of Whitehall which burned down in 1698. Pembroke House had its own entrance lodge on the W (inland) side. The back (E side) looked directly onto the River Thames. The 9th Earl succ as Earl in 1733. His son the 10th Earl of Pembroke was born at Pembroke House in 1734. The 9th Earl died there in 1750. Pembroke House was re-built 1756-59 by 10th Earl of Pembroke. Mary Fitzwilliam (wife of 9th Earl and mother of 10th Earl) apparently died there 1769. 11th Earl of Pembroke died there in 1827. His nephew Rev. George Augustus Montgomery wrote letter from there 1827. The Victoria Embankment was built 1865 to 1870 out into the river, and there was now more land at the back (to the E of) Pembroke House. This was laid out as a garden. Pembroke House was demolished 1938, but parts of it were saved. The site is now the massive Ministry of Defence building (built in phases 1939-59). The Ministry of Defence is an unusual building that has preserved inside it some of the former architecture of the site, including the 1514-16 wine cellar from the Palace of Whitehall. Room 27 - The former gallery. Room 24 - A former bedroom, from the N wing of Pembroke House. Room 13 - A former bedroom, from the N wing of Pembroke House. The balustrade of Pembroke House (presumably the rooftop one) was saved and is now at Queen's House, Greenwich. Pembroke House, view from W (inland) side, showing entrance lodge and main building. From Illustrated London News, 30 Dec 1854. Letter from Rev. George Augustus Montgomery to his sister Elizabeth, written from Pembroke House, 1827, after the death of their uncle the 11th Earl of Pembroke. Riverfront of buildings on E side of Whitehall. 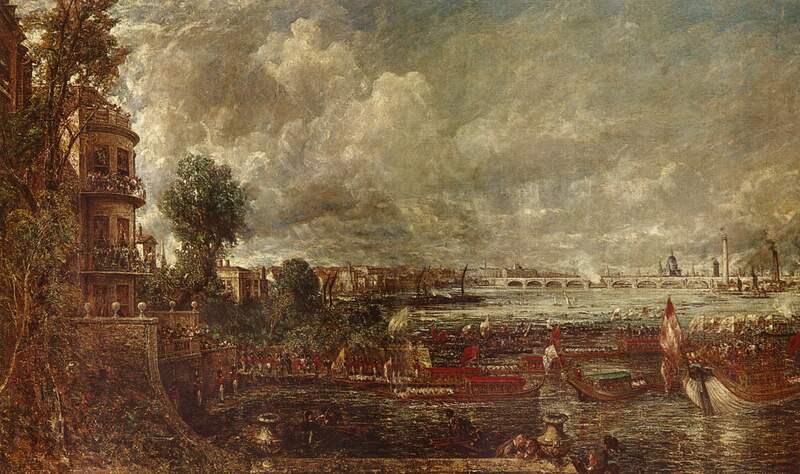 From "The Opening of Waterloo Bridge seen from Whitehall Stairs" by John Constable (painted 1832, depicts the opening of 1817). The view is looking N up the river towards Waterloo Bridge. 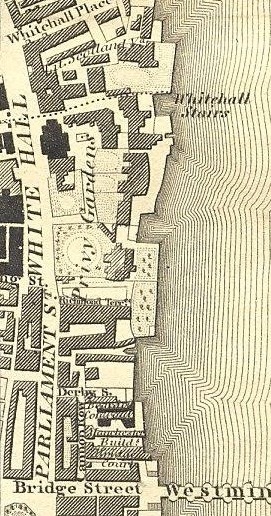 Whitehall Stairs was a dock just to the N of Pembroke House. 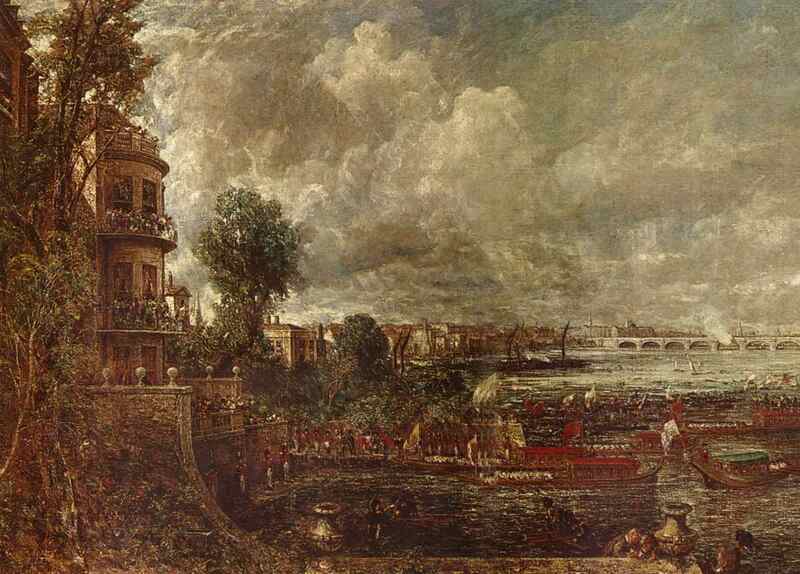 The picture shows the Prince Regent about to board the Royal barge at Whitehall Stairs. Pembroke House may be the house at extreme left, to the left of the tree. 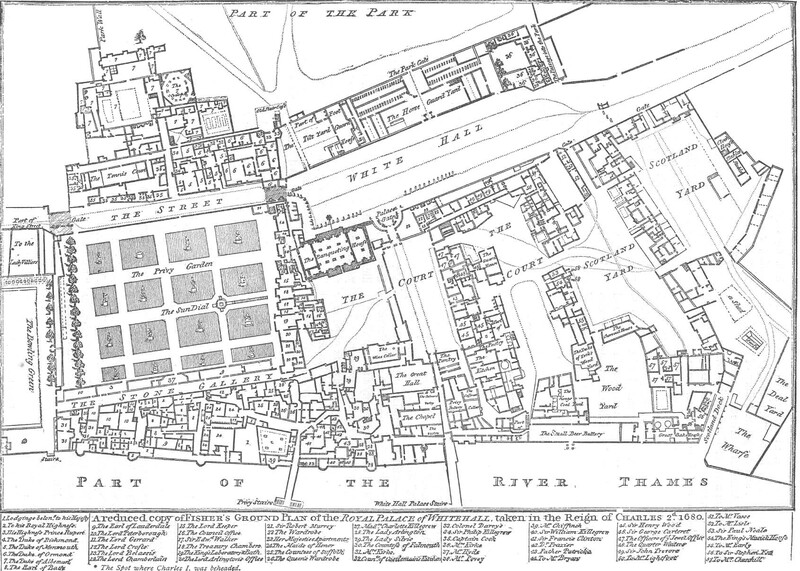 Plan of the great Palace of Whitehall in 1680. Up is W.
The palace almost entirely burned down in 1698. 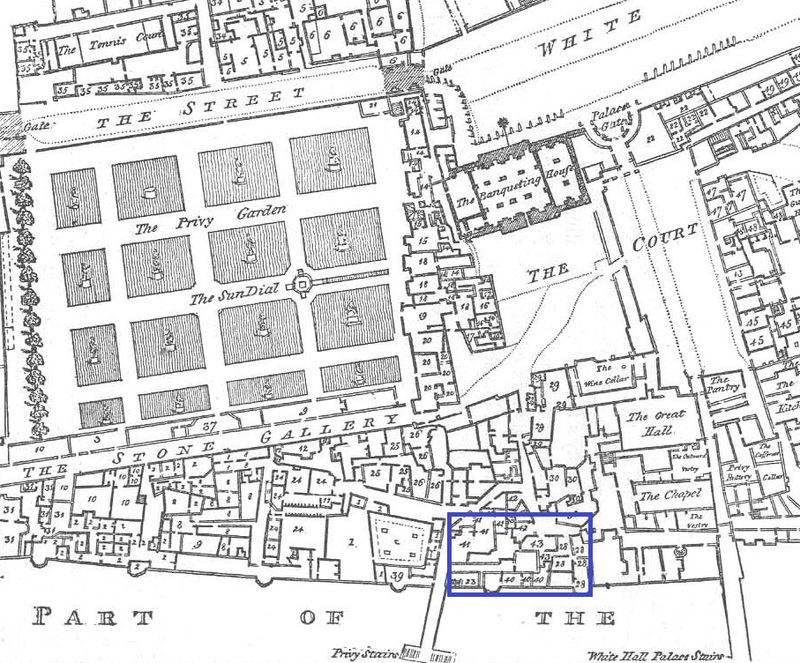 Blue area is the site on which was built Pembroke House in 1723-24. 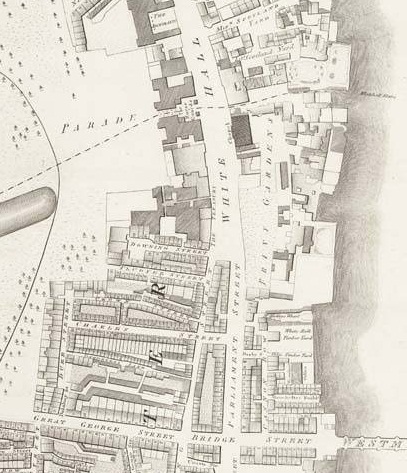 Later Victoria Embankment was built out into the river and there was more land below (to the E of) Pembroke House. 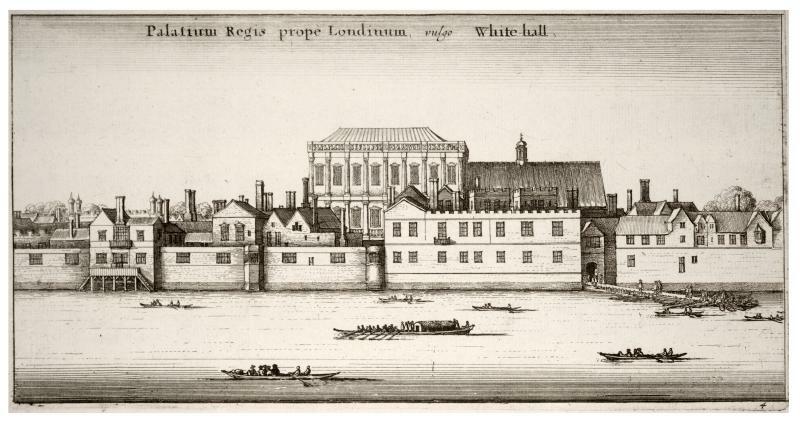 Part of Whitehall Palace, from the river, before the fire of 1698. Engraved by Wenceslaus Hollar (died 1677). The Banqueting House is the large building in the centre background. From University of Massachusetts. Image credit University of Toronto. 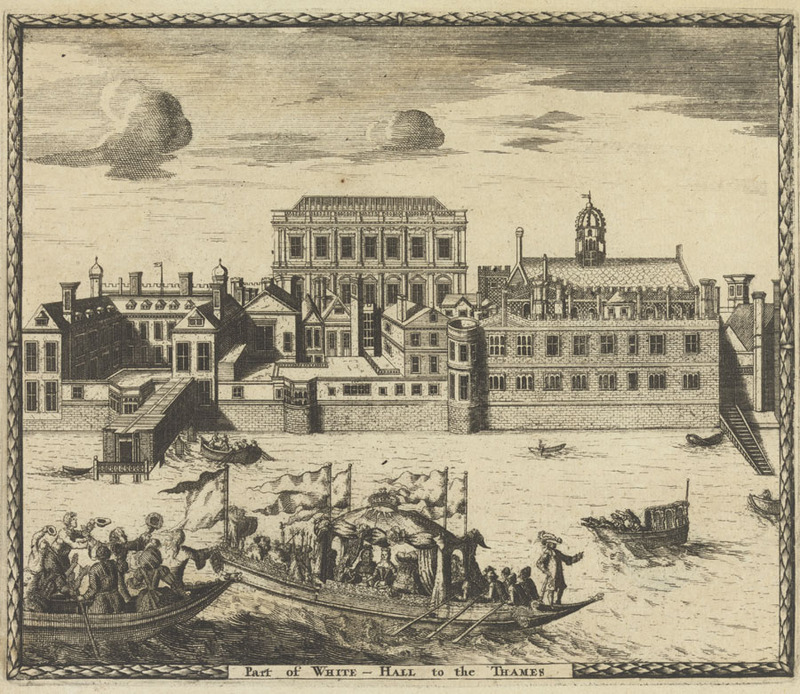 View of Whitehall from the river, late 17th century. From University of Massachusetts. Image credit Yale Center for British Art, Paul Mellon Collection. 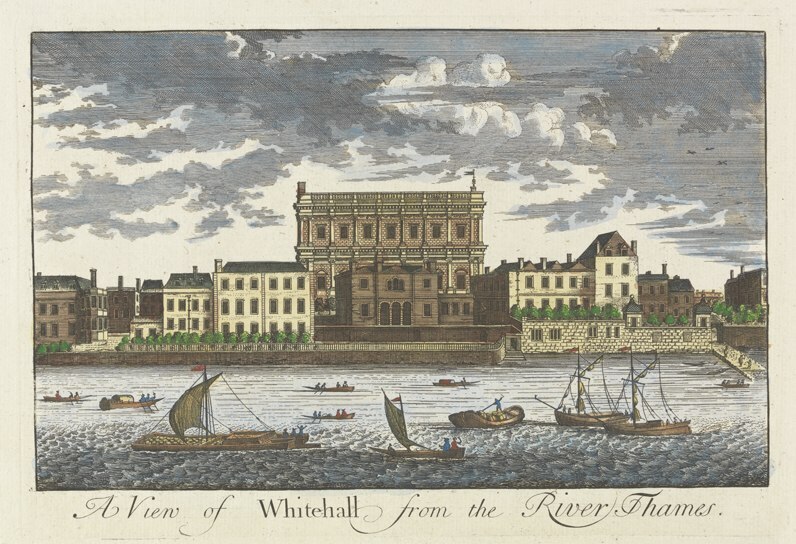 View of Whitehall from the river, early 18th century. It is unclear if the building in front of the Banqueting House is Pembroke House or Malmesbury House. 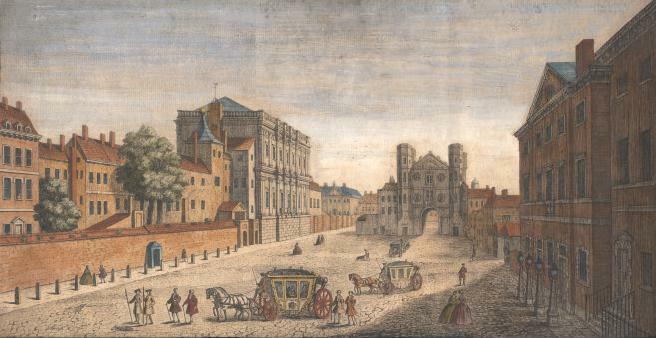 A view of Whitehall, looking south, in 1740. The Banqueting House is the massive grey building on the left. 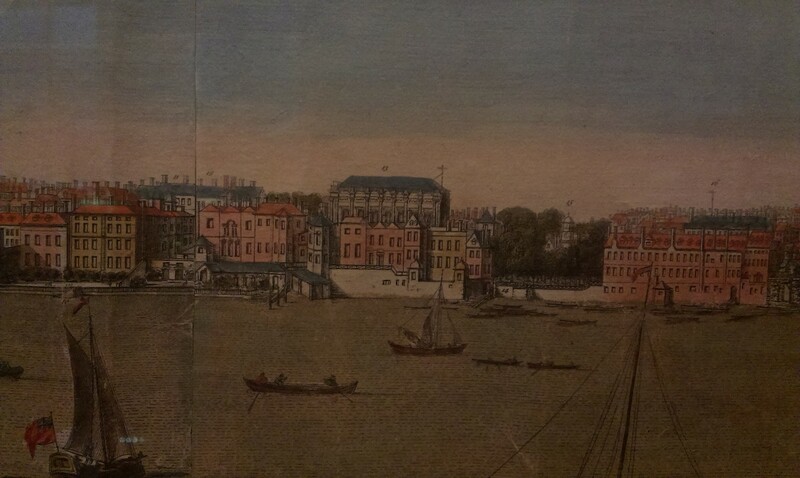 Pembroke House is now built, and would be behind the Banqueting House, not visible from this view. See modern street view of same location. 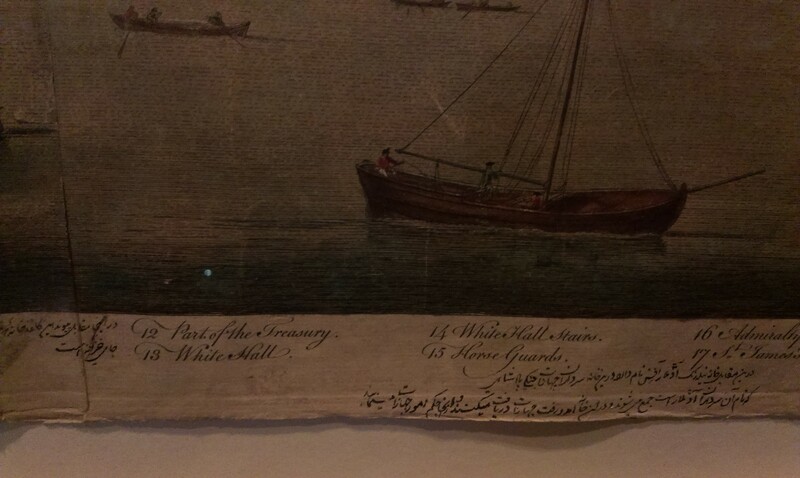 "White Hall" (13) and "White Hall stairs" (14) on View of London by Buck, 1777 (first pub 1748). See larger and full size and plan. 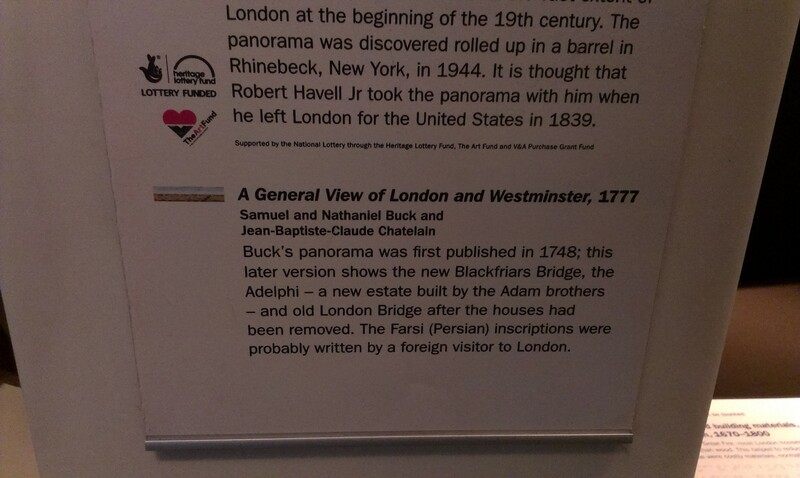 On display at Museum of London. Privy Gardens, E side of Whitehall, on the river front, London. 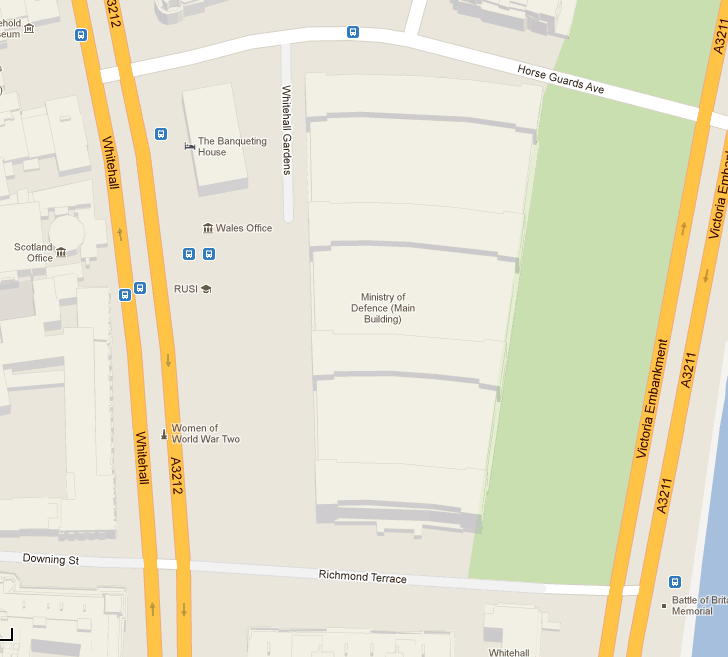 Location of Pembroke House. Privy Gardens was entirely cleared for the massive Ministry of Defence building, built between 1938 and 1959. Nothing remains of Pembroke House or its entrance lodge. See Google maps (has satellite view and street view).